[Whoopjohn] decided to build a driver board for a display he pulled from a pinball machine. You’ve probably seen these used to scroll both score and messages using a total of sixteen 15-segment digits. We’d love to get our hands on one, and you might too but where? [Whoopjohn] notes that these were usually installed two-per machine and the driver boards were run close to their maximum ratings. That means that somewhere there’s a collection of broken machines with working displays. If you do plan to make this happen, you should be able to figure out the circuit based on this commented board layout (pdf). The most fun about these plasma displays is the 180VDC power supply. I used to work on an instrument that used a 7-segment version, and that 180V line snaking among the logic level stuff provided many opportunities to get your attention and / or let the smoke out. reminds me of the delorean display in back to the future. sweet hack. Yeah that display looks nice. I’m a fan of simple HD44780s myself but I can think of a use for one of those. @Mowcius: Fixed that typo, thanks. Also, if you like HD44780 why not make this compatible? If you can get the board working the protocol implementation would be a snap. Re vfd try noritaki itron. They make a large portion of the vfds out there. Nice! I picked up a couple of these at California Extreme last month. They’re huge. I’m sure one day I’ll get around to making something with them. another neat hack is if you run into one of the small laptops (1980’s era) with the “plasma” screens, often the driver chips or mainboard would fail but the screen itself was near bulletproof so if you remove them and kludge your own driver this would make an excellent pinball “screen” replacement. additional idea:- get one of the HD44780 based long panels, and replace the white backlight LEDs with orange ones, they look very nice when lit. a cheap source for orange LEDs is those “halloween” pumpkin lights they sell at dollar stores, for some reason they can never get rid of them so B&Q often sell them on extra cheap. back to the future deloran display! I got hackadated? Oh, OK. I don’t know where someone got the idea these are 15 segment devices. The digits have 14 segments – the top and bottom segments being one single bar. Most digits have a decimal point and comma, so that makes 16 segments I guess, but in a 7 segment display you don’t count these as segments. The right hand last pair of digits have no commas. There are some 7 digit version of these displays, which might make a more modest starting point. 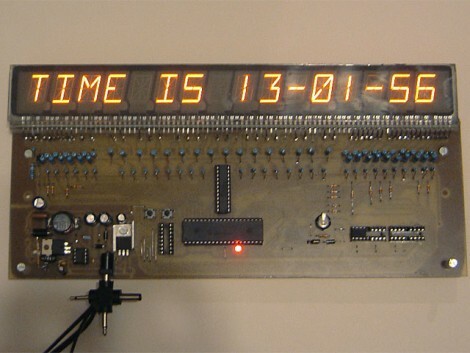 This clock is still waiting for some crazy pinball-style scrolling routines to be added. It still works well, is flicker-free. The MAX1771 chip I used for the 12v to 180v converter is very very picky about layout, especially in the feedback loop. It can pick up noise and fail to regulate, although here my present configuration is stable. I have issues in another clock using this device. The current sensing resistors shown are too high. Should be a total of .05 ohm, not 0.5. The display PCBs that use these arrays have UDN driver ICs that are unobtainium. Most were working at their absolute limit and these chips tended to fry easily. These used a +90v 0v and -90v configuration. I used Ov and 180v and a pull-mid to around 100v, based on the standard Bally display circuitry they used on their earlier 6 and 7 digit displays. These you can easily find on the web. There are two transistors for the anode drivers and one per cathode driver. You can’t see these in the picture because they are surface mounted on the other side, as are some of the necessary resistors. So you won’t work it out from the picture but they are on my annotated PCB. No I don’t have a schematic. schematics are for wimps. I vaguely work out a strategy, go straight to PBC design. I use Osmond PCB on a Mac. I etch a board and hope for the best. Works for me. Usually.